Usher in the New Year with a glittery celebration of singing and dancing that will delight the senses. Salute to Vienna New Year’s Eve Concert recreates the beauty of Vienna’s golden era and its elegance charms audiences of every age. 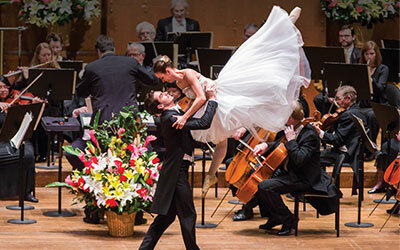 A 13-year New Brunswick tradition, this year’s concert will feature a brilliant new program of Strauss waltzes and sweeping melodies from beloved operettas performed by the Strauss Symphony of America featuring three artists from Vienna, soprano Iva Schell, tenor Martin Piskorski, and conductor Christoph Campestrini. Marvel at dancers from the Europaballett St.Pölten from Austria and International Champion Ballroom Dancers. The first effortless notes of the eternal Blue Danube Waltz will welcome you into a triumphant 2019!